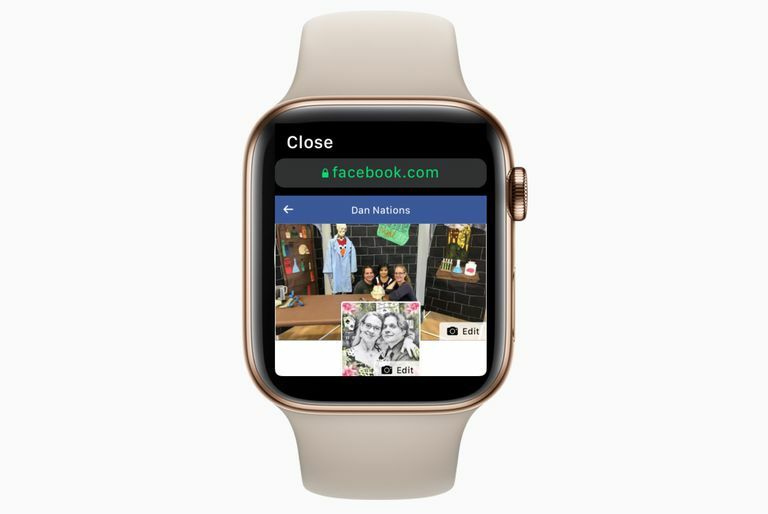 While Facebook doesn't have an official app for Apple Watch, it is possible to browse Facebook on your wrist rather than reaching for your iPhone. And Apple has made this even easier by embedding WebKit, the engine for the Safari web browser, into the Apple Watch's operating system with the watchOS 5 update. Unfortunately, Apple didn't actually include the Safari app, so you will need to jump through a couple of hoops to launch Facebook on your Apple Watch. WatchOS 5 is not compatible with the original Apple Watch, however, it is compatible with Apple Watch Series 1-4. While there isn't a Safari browser on your Apple Watch, the WebKit engine introduced in watchOS 5 allows full web page to be opened when tapping a link in an email or text message. And while these web pages won't have all of the functionality of your iPhone or laptop, which means you won't be able to watch YouTube videos, you can consume most other content from Facebook. In fact, Facebook automatically formats for the Apple Watch's screen, so you'll be amazed at just how easy it is to read updates. The email message should be sent to an account you have setup for the Mail program on your iPhone. This will allow you to read the email message on your Apple Watch. On your Apple Watch, launch the Mail app and navigate to the inbox of the mail client where you addressed the email. When you open the inbox, swipe down on the screen to force the Mail client to download new messages. After the email appears on your Apple Watch, open the message and tap on the Facebook link. After Facebook loads, you will need to log into your account. The good news is the Apple Watch will remember your login credentials, so you should only need to login once. Why an email message instead of a text message? A text message sent to yourself will also get the job done, but the great thing about an email message is the ability to flag it. This will make it easier to find the email in the future when you want to browse Facebook on your Apple Watch. Flagged messages appear as an additional mailbox under Gmail, Yahoo! and your other inboxes. You can flag the email message with the Facebook link by holding your finger down on the Apple Watch display while the message is on screen. A menu will pop up. Simply tap Flag and the email message will appear in the Flagged inbox for easy future reference. This trick will work with most other websites as well, but advanced features such as streaming video may not work, which means no streaming from Netflix to your watch... yet. If your main concern is chatting with friends, you don't need a workaround to use Facebook Messenger on your Apple Watch. You simply need to download the Messenger app. If you already have Messenger on your iPhone, you should actually already have access to Facebook Messenger on your Apple Watch, however, it may be set not to display on your watch. If you want to check to see if Messenger is already installed, tap the My Watch button at the bottom of the screen and scroll down until you reach the "Installed On Apple Watch" section. If Messenger is listed, tap it to confirm Show App On Apple Watch is turned on. If you need to add the app to your Apple Watch, tap the Search button at the bottom of the screen and type "Messenger" into the search box. Facebook's Messenger app should be near the top. Tap the Get button or the button with the cloud to download the app to your watch. Did you know Apple Watch can connect to Wi-Fi without an iPhone?